Every night, after the park closes, Disneyland unleashes 200+ feral cats who prowl the Park and keep the roden population under control. During the day, these cats lead a, well, dog's life. They live in well-maintained cat houses, dine at the five or so hidden feeding stations, have access to health care (shots, neutering, spaying, no botox though :) ). The cats are kept under wraps when the Park is open to guests, although rumor has it you might be able to spot a cute tabby face from the Jungle Cruise ride. How did Disneyland end up employing dozens of our feline friends? In the late 1950s, the Sleeping Beauty castle underwent a major renovation. Guess who construction works found squatting inside the castle? Over a hundred Orange County alley cats. Along with a huge number of fleas! 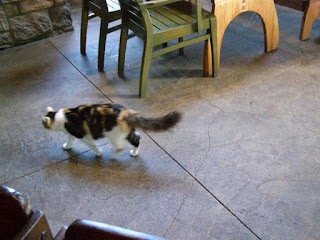 Disneyland tried to evict the cats, but to no avail. And then a bright Disneyland employee mentioned how they weren't having the problems with rodents that once plagued the Park. And, voila, the furry workers were hired! Without an interview! And I leave you with a photo I did take. 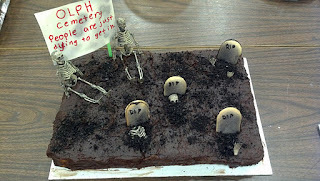 It's of Child #4's winning graveyard cake. It took first at her school's Halloween Carnival this past weekend! Please check out the posts by the other My Town Monday participants by clicking here. Happy Halloween! That cat is quite creepy, haha. Thank you, Child #4! 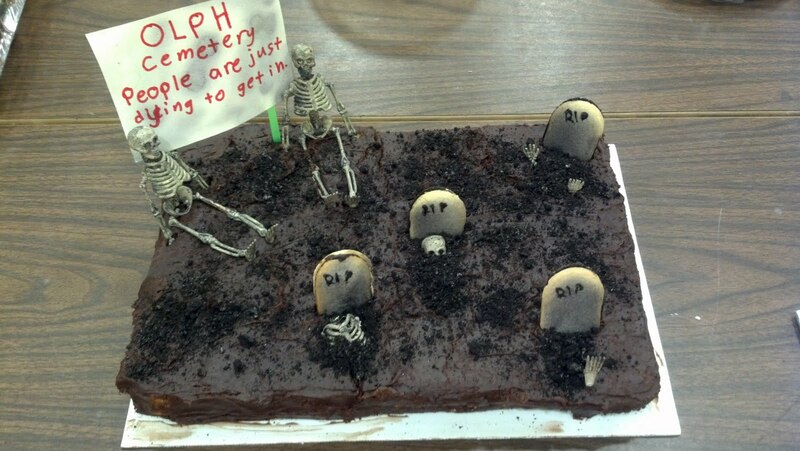 And congrats on your amazing graveyard cake! Now, go get ready for school!! I’m afraid of cats (childhood incident I’ve blocked?). Your post is the stuff of nightmares. I cringe to think of somehow ever ending up being stuck inside Disneyland at night. AbaGayle: I will pass along your congrats! Sarakastic: Glad you like the story. I do hope the cats aren't thinking....Today Disneyland, Tomorrow the world! Beth: Since you dislike cats, are you one of those people cats flock to? In which case, I can see you at disneyland with a line of cats following you everywhere! :) Yikes! Really??? Wow, that's a fantastic story. LOL who knew? Mickey and friends had better stay in at night! Tricia: I really do believe it's for real. I found several references. I know the next time I go to Disneyland, it'll be with an eye peeled for cats! Jeannette: According to one of my kids who did a project on Walt Disney, Walt was actually afraid of mice! Better than pesticides for sure. That's a fun tidbit about the cats. Ferals are quite useful. Took us over a year to catch and spay ours (a year and 14 kitten placements). She's very protective of her territory and chases most other cats away. Our feral colony of one (or maybe two - I think she has a boyfriend these days). Wow! Who knew? I guess you learn something new every day. Loved reading about the undercover cats! Someone sent me a website a while back with a bunch of interesting facts about Disneyland, I wish I had it, it was very interesting. And they mentioned these cats! I thought it still seemed a little fake but now that I see this I guess it is true. Disneyland is a much more mysterious place then they let it seems on the exterior. I really want to go to that exclusive club they have. We saw no cats while at Disneyland last month (good thing - I'm allergic!) but this whole concept intrigues me. How do they round up the cats? How do they keep the park from smelling strongly of cat urine? 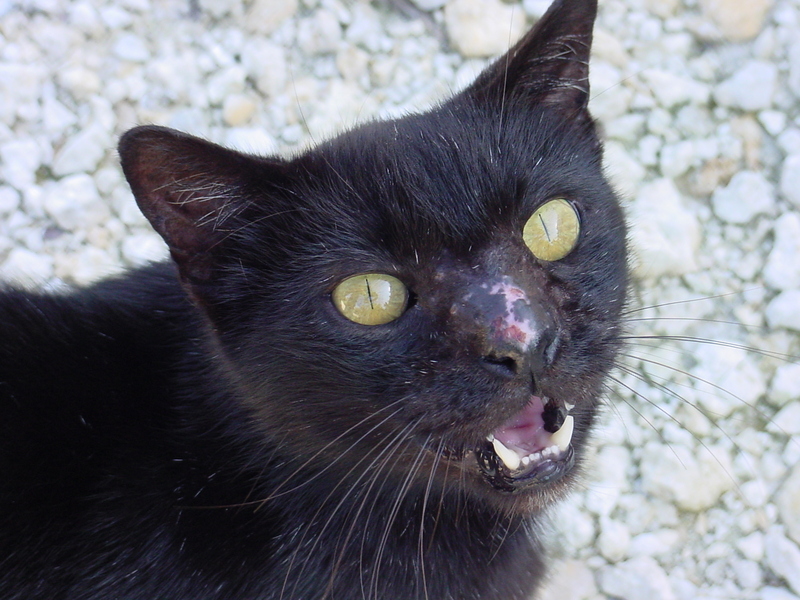 If they're housed, fed, and vaccinated, what makes them feral? What fun.